Restaurants come and go all the time, especially in Portland, where they are opening every five minutes. Some are really tough to see go, as they hold so many good memories for you, Lauro Kitchen being the most recent case for me (although I must say that I liked it less after reading the owner say that he basically lost interest in Lauro, largely wanting to concentrate on his big money maker downtown, Nel Centro, a very corporate sort of dining experience.) About eight years ago I loved Echo, a friendly neighborhood eatery on MLK that had good food and reasonable prices. 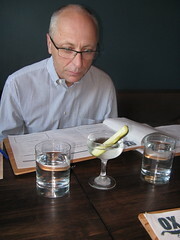 That was before Portland’s dining explosion, however, where suddenly you had 50 restaurants with great food, and even a few with reasonable prices. Even worse for Echo, many were suddenly opening in the previously gritty inner NE area where it had previously been an oasis in the rough. Before you knew it, there were great places on Russell, Mississippi, Killingsworth, and Alberta, so Echo had to suffer in attendance, not helped by a decline in the quality of the food (they used to have my favorite burger) and new ownership. Then Echo was “closed for remodeling,” soon followed by closed forever. Although I had not been there for four or five years, I did have some sad moments thinking of the previous pleasant meals I had partaken of at Echo, such a cozy place, but these sad moments were mitigated by the slippage that occurred before they closed, and the fact that we have way too many good restaurants here, it seems like you are no longer able to patronize all of them, even those you have really liked in the past. 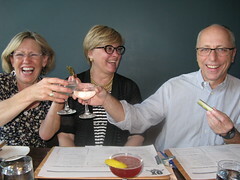 I knew Ox had to be a difficult reservation for a large-like group on a Friday night, so I made it a month in advance. The original reservation for 10, a decent sized group, and I had the choice of 6:15 or much later (8:30-9:30???) so I selected the slightly earlier than usual 6:15, as many of us are pretty old to be out after summer darkness falls (like on “Modern Family” when Cameron and Mitchell are trying to make a reservation at a L.A. hotspot and have two choices, 5:00 (what are we, 80?) or 10:30 (what are we, 20?) Anyway, just getting a group reservation on a Friday pleased me (some places won’t do it on a weekend) so, so far, so good. My feather ruffling came, however, when I called about a week later to find out if I could add two more seats, as I now had 11 people who wanted to chow down at Ox. The phone answering person, who I talked to both times, had no trouble upping the ante to 12, but said with groups this size, the restaurant would like us to have a fixed menu. WHAT? This was such an odd request, I had to ask her what she meant. 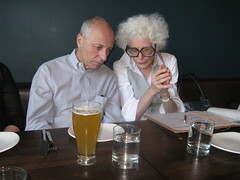 She said she and I could look over the menu and select a few items for our party, and those were the items we would have to order. WHAT? She said it made it easier on the kitchen. I’ve done like 115 dinners with this group now, and it’s never been suggested to me by any restaurant that I limit our options in any way. We are a diversified group, and we like to have free reign of all the majesty and bounty a restaurant has to offer. We know how to eat out, we want it ALL. I explained to the reservationist that this policy just would not work with our group, as some were vegetarians (at that time a non-fish eating vegetarian was supposed to join us) some of us feel bad about eating certain animals, others prefer seafood, and some of us were planning on gobbling meat all night long. I could not deny people their options. I guess she found my lack of acquiesce frustrating, or unusual, since when I said “how about if we go down to 11?” the real number of people I had at that time, she coldly said “I’ll put down 12” and abruptly hung up the phone. Hey man, I was only trying to be helpful, as she said the rule was for parties of 12 or more, and I really would have sufficed with the eleven I already had. In the end, I only ended up with nine, as two people flaked at the very last second, and have now been banished from survivor island, a drastic action I take sometimes when people fizzle out too many times, especially in an instance like this, where two people would have been happy to fill their seats, given more than an hour’s advance notice. Although things have been rearranged a bit, the Ox space still reminded me of Echo. It used to be when you walked in the door, the first thing you saw was the bar. Now that’s the location of the inferno of all cooking desires (the special oven.) The bar has been moved to the NE corner of the space. Before Echo had these great big wooden booths in the large front windows with draping curtains. Ox has jettisoned the booths (they were really pleasant, but probably took up too much floor space) and have tables and a big blue/gray banquette running across the south wall with two and four toppers. Had I been concentrating more on the space and less on my dining companions (and the food) I probably would have noticed a multitude of ways Ox is different from Echo, but just as the exposed brickwork always dominated the decor at Echo, it also dominates the surrounding at Ox. One thing that makes Ox completely different, the minute you enter, you smell that wood-smoky grilling aroma, it’s everywhere. A few people on Yelp!, who dined at Ox in the early days, said the smell made them cough, or made their clothes smell like a campfire, so I warned people coming to the dinner to not wear their fanciest finery (that was hard to clean.) Although that omnipresent wood oven smell is everywhere at Ox, I never found it overpowering or pungent, it didn’t make me cough (and I have sensitive lungs) and it didn’t smell up my clothes at all. It smelled delicious all the time we were there, and went no further. 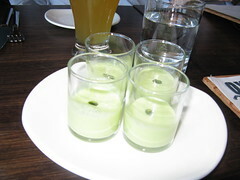 I recently ate at the newer location of Podnah’s finally, and found the small very similar. The smell of tastiness. I really do try hard to keep my masses of people organized and somewhat together to make it as easy as possible on the restaurants (even if I do reject fixed menus) but this dinner did not get off to an overly smooth start. First our two hung-over. last minute flakees (their excuse) left me with the two open seats when it was too late to fill them, then Liz got behind schedule and ended up late (but kindly called the restaurant to notify us) after that we feared Glenda, who was bussing it, would never show up (it turns out she didn’t actually know what time the dinner started.) All of this made for a lot of waiting around and staggered ordering, which led to us really occupying nine spaces at Ox for way too long on a Friday evening. As this was such a festive dinner (6th Anniversary Party!!!) I really would have loved to have tried one of the fun sounding drinks at Ox, but Ox, like many of the places we have visited recently, isn’t exactly a budget meal. Also, I was planning on having a top of the line cut of meat, so I had to keep it as basic as possible otherwise, a salad, my meat, a side order of potatoes (like many meat oriented places, everything is ala carte) and maybe some dessert. I think there are two kinds of people in this world, those who will sacrifice a drink to have dessert, and those that will sacrifice dessert for a drink, instead. So, what can I say, I may end up roly poly (we’ll pretend I’m not there yet) but I most likely won’t kick it from cirrhosis. And realistically, who can really say which vice is worse for you? It really depends on which health report you read which week. Anyway, I ended up having an iced Mate’ tea, just as Sam did, who was sitting next to me. It looked really pretty, all bright and green, but it tasted quite lousy, totally lacking in the sugary ingredients I need to douse my tea with to make it ingestible. Since we were already keeping the waitress hustling enough, I didn’t want to ask for sugar too. 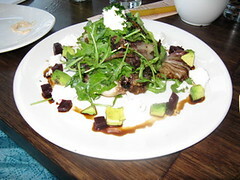 Several of us wanted to start with salads, and Ox had a couple, both big and bold, in portion and taste. 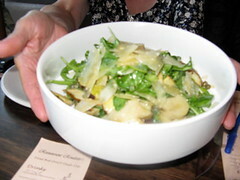 Sam ordered the larger size of the Grilled radicchio, arugula, chevre, grilled corn, and toasted garlic-anchovy vinaigrette. She passed it around, and after tasting both salads I think it was the better of the two on the menu, and the chevre was incredibly tasty, so mild. The salad I selected, which David and Shuhong, and I think maybe Liz ordered, was the Green Kale, gem lettuces, feta-ranch dressing, fried chickpeas, kalamata olive, and strawberries (replaced on this evening by seasonal Bing Cherries.) 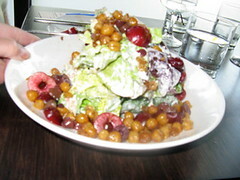 This was an incredibly inventive salad, full of textures and tastes, the crunchy fried garbanzo beans, the juicy cherries, and unusual flavor added by the olives, very unique, and good, although even after I shared a good bit, so large I had a hard time making it through the whole thing. 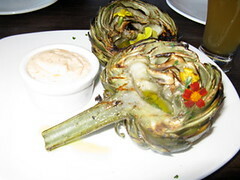 Peter and Tracy started out with the grilled artichoke with espelette mayo, two large halves and the aioli like dipping sauce. This was one of the most beautiful things at the table this night (and Ox produces some attractive food) not only because of the naturally attractive nature of the artichoke, complimented with a lovely char, but because it was sprinkled with bright little marigolds and other colorful flowers. So pretty. Today I was talking to a woman along one of my walking routes about the monster artichoke plant in her yard (30 artichokes!) and she said that even though she really liked artichokes, it almost wasn’t worth the effort to eat them, and that was what I was thinking during this dinner, watching Tracy and Peter eat theirs, ripping off all the little armor plates for a tiny little bite at the end. I’ve never really been an artichoke person (that would be really uncomfortable, to be an artichoke person) but I did sample some, as they were sharing with everyone, and I suppose with the smoky flavor, it was about as tasty as an artichoke could be. They said it was especially good when you got to the extra flavorful center portion. Glenda also got an artichoke in the half portion size, but she had way too much food, so took it home for later, the flowers undisturbed. 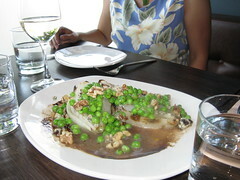 Another interesting starter this evening, which Cora couldn’t resist, was the Ash roasted Willamette Sweet onion, fourme d’Ambert blue cheese, english peas and toasted walnut. This is a good example of the observation I made earlier, about vegetarians having all kinds of interesting options from Ox. Another observation, obviously fresh English peas are in season right now, as they were generously used in two dishes at the table this evening. 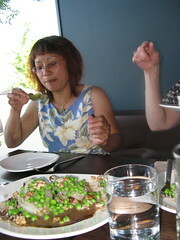 Ox is not a good place for pea-haters in the early summer, I guess. It would have been interesting to know what an ash roasted preparation entails, whether it means the onion was roasted in ashes, or if it was roasted until the outside of the onion was covered in ash. At least for now, I guess that will have to remain one of life’s mysteries. It was delicious though, so whatever they did must have worked. 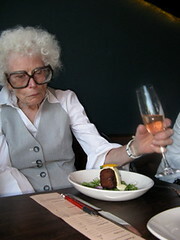 Cora, who clearly had an earthy, meaty upbringing, is famous for loving tongue, so she was very enthusiastic toward the Smoked beef tongue on vinaigrette with horseradish, ensalada rusa and sweetbread croutons. 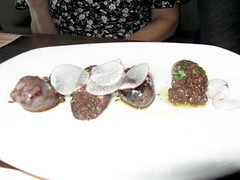 It’s hard to say which item I would pine away for less, the beef tongue itself or the sweetbread croutons, but I did take a modest bite, and didn’t hurl, so it must have been quite decent. After this, Cora went for the House Morcilla – blood sausage, which really was several hunks of blood sausage, not very well disguised to look like anything else. We actually had two orders of this at the table, perhaps it was a favorite of Peter’s when he was living in his native Sweden, and he jumped on it as well, as he seems to like those sausages. I know budin blanc and budin noir have been relatively popular here at fancy restaurants the last couple of years, but it still is not a taste I have managed to acquire. As Liz put it, rather perfectly, too ironee. Here you would think I’d enjoy an ironic sausage, but maybe it just goes over my head. 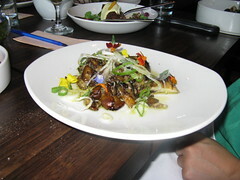 I’m pretty sure Cora ordered yet another item, the Sauteed mushrooms, foie gras, spring onion, and spinach. This woman’s wallet must have looked like a black hole at the end of the evening, although she didn’t have one of the major steaks, or dessert either, so maybe her bill wasn’t any worse than mine. I think I had a bite, but everything toward the middle of the dinner sort of runs together, as there was so much sharing at our table, you could have come with an empty plate and gone home stuffed. 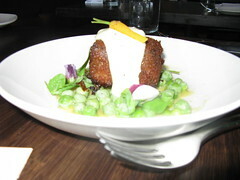 Fried shortrib terrine, frozen pea salad, baby carrots, verjus lemon aioli. 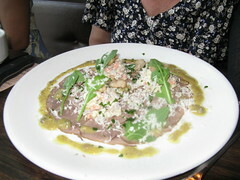 This dish was a mystery to us for awhile, as Glenda ordered it in a hurry (maybe she asked the waitress for suggestions?) then when it came she had no idea what it was. Everyone kept asking, “hey Glenda. what’s that?” her reply being that she didn’t know. Even after having a few bites, she was not sure. Finally she got a hold of a menu, or asked the server, or that lightbulb above her head came on, and she told us it was beef. Liz had an order towards the end of the meal, and it was really rich and flavorful, as many items involving short ribs tend to be. Also featured, yet more masses of English peas! Liz was also doing the multiple small plate thing, and she ended up with one of the absolute tastiest things at the table (and there were lots of those) the Maitake mushroom with smoked sea salt. This mushroom preparation (one of three on the menu) was incredibly smoke flavored and meaty, certainly the kind of dish people have in mind when that want to use a mushroom to resemble beef. 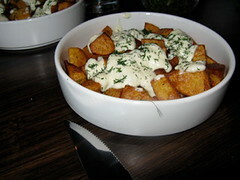 The texture was wonderful and the flavor was wonderful, and Liz said it was the best thing she had all night. Now on to those major meaty bits ….. after first discussing our major side dish. Here’s those Ox eats that screamed Argentina, several different cuts of beef, all served with their deliciously parsley and garlic version of Chimichurri. David, who likes both spicy and less spicy food, was much happier with his beef preparation, the Flanken style beef short rib. Although I love to eat them and buy them to grill, I’ve never been quite sure what makes these thin and bony ribs “flanken.” It turns out that description merely refers to ribs that are cut across the bones, rather than parallel to the bones. It’s true that you get at least as much bone as meat, and that the meat is often quite chewy, but I love the way Hawaiian and Korean cuisine make use of this rich cut of beef (like tiny rib steaks!) As he was a ways down the table from me, and the dinner was very noisy, I didn’t hear if there was any preparation or rub on the rib slices, or if they were simply grilled, but David said they were delicious, although he thought the big, honking steaks looked best. I traditionally blanche at any entree $30 or more, but I occasionally break down if it’s a ribeye, especially if it’s at a place who specializes in steak. Also, if you compare what you get at Ox for $30 or $35, opposed to a probably less well prepared piece of beef at one of the famous steakhouses (no, I’m not referring to Sizzler) the price is actually relatively “reasonable.” In the beginning, I think Ox primarily featured a standard, American cut of ribeye, but they have recently added a second Uruguayan ribeye, this one being leaner and grass fed. I asked the waitress what the difference was, especially as you would first assume the imported beef would cost more (it’s $30, and 12 oz., opposed to the 16 oz. standard at $35.) Since the Uruguayan ribeye was grass fed, the fat content was less, and she explained the meat would be earthier and less marbled. The standard ribeye (perhaps corn fed) would be more tender, with much more fat (from the sizes, most likely about 4 pounds of fat, yikes.) I suppose if you are not a big beef eater, you might wonder why someone would pay more for a higher content of “unhealthy” fat and less meat on their steak, but ribeye needs a decent portion of fat for flavor, just like very lean prime rib can be tough and bland (since it’s the same cut of beef before it’s cut into steaks.) I guess that’s why three out of four of us had the fattier ribeye. Sam, who isn’t always keen on eating animals, evidently doesn’t have quite as many issues with beef as some other creatures, as looking at a steak never seems to remind her of a pocket pet and reduce her to tears. Now and then she goes all out and has a steak or a burger. 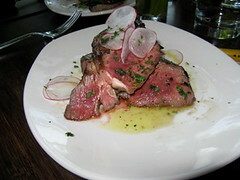 She debated back and forth, and finally decided she would try the imported Uruguayan grass fed Ribeye. She’s an earthy girl, and as it was a beautiful cut of meat, well prepared, I think she enjoyed it fully, kindly sharing samples around the table. 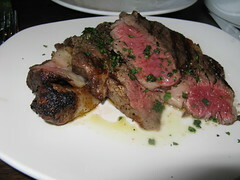 Tracy, Glenda and myself all splurged on the more fat-prone, less earth friendly standard ribeye. Although normally I would be suspicious of a ribeye that is sliced in big, beautiful hunks (suspicious thoughts would include, is this really a ribeye? are there grain and toughness issues? 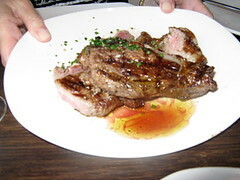 and is this really a complete steak???) I think Ox just does this to make the meat look more impressive, or maybe it’s the way they do it in Argentina, all splayed out on the plate, from lean to fatty. Whatever the reason, this was a delicious steak, charred slightly around the edges, cooked to perfection, with a whole selection of fatty areas to choose from (I actually left at least 1/2 my fat on the plate, a record.) Why pay more for fat you leave on your plate, the thrifty or health conscious might ask. Because it gives the surrounding meat richer flavor, I would reply. As my co-diners in this group would attest, I’ve eaten a whole lot of steak in my six years hosting this group, and off the top of my head I can’t remember having a better steak, although the Smoked Coppa Steak at Toro Bravo is always wonderful as well, but not as genuine to the true flavor of the beef as this simply grilled steak at Ox. In fact, the steak was so good on its own, I forgot to add any Chimichurri, although I tasted it on a hunk of bread earlier and thought it was really nice. For the first few months Ox only had about three desserts. a pudding, a cake, and a torte, but looking at their web menu tonight, I see that they added a couple more, a “Buckle” and something they call “Magic.” A place like this probably doesn’t need many desserts, as people get so stuffed on the generous portions that come before, few probably make it to dessert comfortably. I shared quite a bit of my steak though, and didn’t have a drink so I could afford an Ox dessert, as i had read good things about the sweet creations here, even if there wasn’t a whole long list to select from. I was a little disappointed that my fellow dessert mainstay, Glenda, declined (she said nothing struck her as perfect to finish her meal) but luckily Sam was there, who loves desserts, especially South American kinds of desserts, so I did have a dessert cohort. 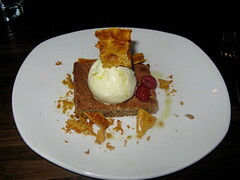 As it happened, Sam and I both decided on the same dessert, the Torte – Warm hazelnut brown butter torte, honey-chamomile ice cream, honeycomb candy. This might have been a let down to the rest of the table, as Ox was very generous with the silverware, so anyone who wanted to try a bite could (yes, we actually shared.) The honey-chamomile ice cream was really silky, and the rather plain “cake” had a really unique browned butter flavor, not particularly sweet. What really made this dessert was the honeycomb candy, which had a really unique texture, both crunchy and crumbly at the same time. Liz found this so unique that she voted the brown butter torte dessert her second favorite thing at this dinner, after her delicious mushrooms. We had such good food and a fun time at Ox, I guess we tarried a bit too long, enjoying some pleasant after dinner moments. I kind of looked around to see if I saw a bunch of people waiting at the door, or pacing staff, but I didn’t observe this. I was thinking about asking the waitress the next time I saw her if we needed to vacate the table, as seven of us were still lingering and talking, but I really didn’t have the opportunity to, as the next time I saw her she came up and requested we leave (that’s us, OCCUPY OX!!) I really didn’t blame Ox for this, the beginning of our dinner so was fragmented from late arrivals, we were there, hogging nine places worth, for over three hours. I understand their dilemma, it was fair of them to hint, or say something, and while we should be respected as good patrons, fair is fair, and other people wanted to sit down and eat at this busy place. That being said, I wish the waitress would have approached her task with a bit better diplomacy, or at least better wording, I can’t remember precisely what she said, but it was close to “we’ve tried to be patient with you, but other people have been waiting, and we need you to leave.” Just not that customer friendly. It was like we were being scolded. Ox should have a standard line to roll out when table hogs like us are in attendance, something more like “we’re so happy you’ve enjoyed the food, and it’s been fun serving you, but it would help us out if you could give your table up now, as some others have been waiting for a bit.” The waitress was very competent, but somewhat brittle at times, and she acted a bit like a testy librarian booting us out for being rowdy (the Glenda Goldwater story!!) That and the thing with the reservation/fixed menu situation added a tiny taint to an otherwise fantastic meal, which bums me a little, because I loved Ox so much, it’s a wonderful place to eat. Ox did so many things right though. They divided the check as many ways as we wanted, despite the fact that they said this was not their normal policy (I did try to help them out by asking as many people as possible to bring cash, but that’s not easy when everyone’s bill ends up between $75-$100 each.) Despite their trepidation, Ox did a great job delivering our varied menu to our table in a timely fashion, the kitchen never seemed overwhelmed (although who knows what this did to the rest of the diners.) They are a generous restaurant, with free bread, extra pickles, and hearty portions. The service was quite good, and most of the staff appeared nice. The setting is really pleasant. They have Ox T-Shirts you can buy, the same worn by the kitchen staff. 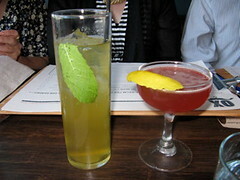 The cooking is delicious, accomplished, and inventive, and the cocktails are fun and interesting. Food Dude at Portland Food and Drink recently ran a collection of readers surveys highlighting the best of almost everything in Portland food and drink, and for Best New Restaurant, Ox came out #1, after only about three months in business (another group favorite, St. Jack, came out #2, although they must have been open very close to a year now, if not 18 months.) Ox is really a crowd-pleaser. Ox “rules to live by” – come in groups of 11 or fewer, have a pickle drink, enjoy delicious eats, buy a T-shirt, and leave in a timely fashion. Then everyone will be happy!!!! Know you want to get along, Jackie, but there is no excuse for how that waitress at Ox treated the group. Someone should tell that waitress that they are in an industry that is mostly based on discretionary spending. And that if she want to insult or scold well-behaved customers who just paid hundreds of dollars to support her place of employment, then maybe she should look for a new job. That being said, we’ve been to Ox, liked the steaks, but weren’t all that impressed with the rest of the menu. Like Cabezon, we won’t be going back. Good old Frank. He’s been an occasional member of this group for six years now, and the only restaurant I can remember him particularly liking was Fin (which went out of business like 10 minutes later.) I know he would tell us he has refined tastes, but it seems to me he just can’t live without begging to differ. He’s a nice enough fellow in person, but give him an iPhone or other computerized device, and he’s like the Attila The Hun of the keyboard. He won’t go back to Ox (he was not there that night, by the way) because he’s offended that the waitress suggested we should think about leaving, after we had hogged a large seating area for three hours, and other people were waiting to dine? Well, how about if he was one of those people who had been waiting to sit down and eat for an extended period? Would he feel differently then? I know our group has been on the other side of the wait when someone else was hogging our reserved table for longer than they should, and we certainly didn’t think very kindly of the table hogs. I know I mentioned the whole situation to begin with, that we were asked to finally leave after a really long dinner, but my main complaint was not that the waitress suggested it was time to go, it was only the way she phrased it, like we were tiresome children acting badly. I’m sure if she was asking us to skedaddle, it was because someone higher up (general manager?) was telling her she had to to get us out. That’s why I suggested that Ox should train their servers how to politely dismiss people, it can’t be fun to boot a large group out after they have spent a lot of money. What can a smallish size restaurant do though, when everyone wants their chance to sit down and eat? I personally can’t wait to go back to Ox, and I know others I dined with that night feel the same way (and several have returned on their own in the interim,) Nowadays, I hear the wait, almost all the time, is between 1.5 and 2 hours. That’s the major problem with Ox, the food is so good you just want to keep eating and never leave. 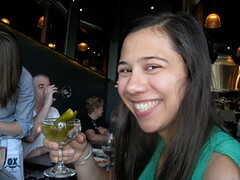 Thanks so much for coming on our podcast and telling us all about Restaurant Roullette and OX! 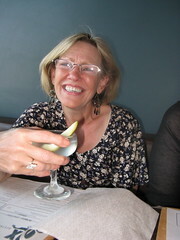 We’ve posted the podcast here: http://mysterymeet.org/find-dining-podcast/podcast-episode-21-ox-in-portland-oregon/.